I have been putting this off for over a day now. I first sat down with the intention of writing my postgame thoughts Saturday night after the seven Michigan State fans I spent most of the weekend with left for the bar, leaving me alone with a glass of whiskey and the hum of Florida vs. LSU in the background. I typed maybe five or six different openings but wasn't happy with what came out, and on top of it I was only half interested in writing anything. I clicked back and forth between other open tabs on Chrome and felt myself pulled further and further into Les Miles world of madness. Finally I pushed the computer away. Sometimes you just need a little time to let things sink in. Such is life for true freshmen in the secondary. Today things aren't any more clear than they were after a night of drinking and rationalizing. I have spent most of the past two days reading the thoughts of others in an attempt to solidify what I am feeling, but to no avail. I've read pieces that have cast the what happened yesterday as an acceptable but disappointing outcome that seems more unacceptable because of who we lost to, others that have taken a slightly more negative slant, and still others that are so overwhelmingly negative that they seem to overlook the fact that this team is still 5-1 despite a defense that is every bit as bad as we knew it would be. Nothing has made me feel any better yet, but such is life after losing a rivalry game at home and being violently reawakened to the reality that for all the brilliance we have witnessed over the past five weeks, this team is still very much a work in progress. This isn't good enough for some, but most of the people who were off the bandwagon Saturday evening are the same ones who have been hoping on and off regularly for the last three years. If we beat Iowa they will hop right back on and claim they always believed. I normally try to tune this kind of talk out. Be it the posters on the mgoboard who had moved the lowest acceptable outcome for this season to 10-2, or the ones who thought a sophomore quarterback with only a handful of starts under his belt was infallible. I like dreams as much as the next guy, but I find reality so much more rewarding in the long run. After a weekend filled with disappointments, some good news, and a whole lot of worrying about the future, we are now back to reality. The defensive line is still a solid unit, and for the first time this season seemed to get sufficient pressure on the quarterback...which didn't matter at all because of horrific breakdowns by the secondary. The defense as a whole forced two punts on MSU's first two possessions. Anyone want to complain about that? Sure the second and third quarters were ugly, but the defense set the team up for a huge momentum swing in the beginning of the game, and the offense wasn't able to capitalize. This team is probably at least two years away from good linebacker play. Losing Mouton will hurt next year, but losing an over matched Obi Ezeh when no one can challenge for his spot this year is even worse. Your starting five in the secondary, by class: Fr, RS-So, RS-Fr (who played WR last year), RS-So (who was a walk on), and finally a Sr (who has played no less than three different positions during his time at UM). Coming off the bench is a RS-Fr and three true Fr. No amount of scheming, blitzing, or magic is going to overcome the mistakes that a group of first and second year players will make, especially when our starting safeties probably couldn't beat our linebackers in a footrace. Yell until you are red in the face, but this unit will continue to frustrate everyone who watches these games. The only cure for inexperience is time. Denard Robinson is still a sophomore. Sophomores make mistakes. 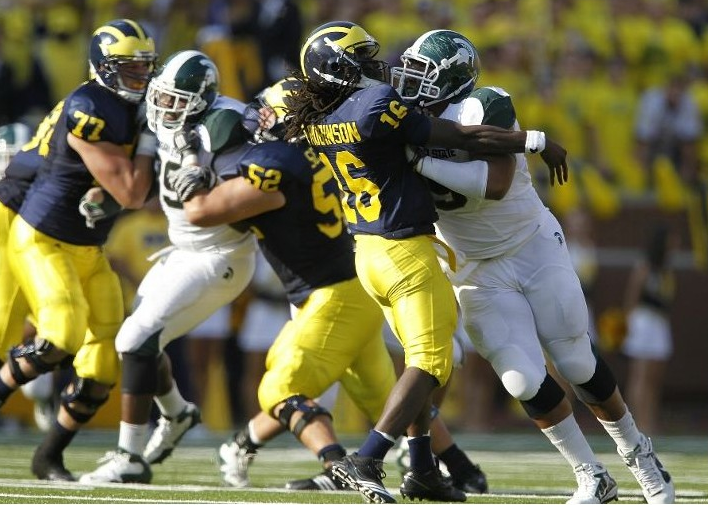 Michigan State put together good coverage in the secondary on all three interceptions and forced Robinson to beat them with his arm. He wasn't able to do that Saturday. The sky is still the limit for this kid. How does our best running back only get four carries? How does our smallest running back get all the short yardage carries? What in god's name did we recruit Stephen Hopkins for if it wasn't 3rd and 1 situations? The running backs haven't done much to distinguish themselves this year, but Saturday the coaching staff failed to give them a chance to succeed. For all of Robinson's struggles throwing the ball, the receivers did not do him any favors on Saturday. Is there anyone who would have thought a 5-1 record would be unacceptable after the first six games? Would anyone have complained about a loss to a top 15 team and one of the favorites to win the Big Ten? 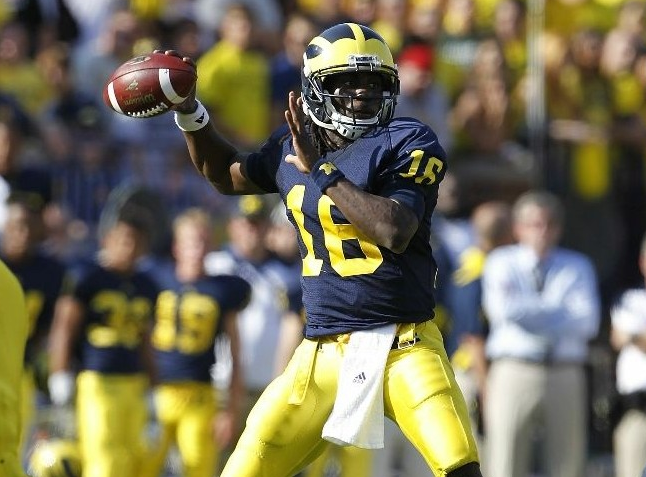 Would anyone have even believed the transformation we have seen from Denard Robinson was possible? Even on his worst day Denard put up 300 yards of offense. The fact is, the more complete team won on Saturday, despite UM leaving a great deal of points on the board in this offense's first truly mortal game of the season, while the defense gave up a number of big plays that had been avoided all year. The sky is not falling. This team is still a couple years away from being a top tier Big Ten performer. We still don't know what Greg Robinson can do with a defense that is built with upperclassmen and a respectable two-deep (although this might be a question that goes unanswered). I got shouted down by a few posters on the mgoboard Saturday night when I reminded everyone that 7-5/8-4 was the ultimate goal of the season. I am still confused as to when success became tied to winning 10 games and a share of the Big Ten. Don't let early successes go to your head. The secondary is still the same group of misfits and first year players that we worried about coming in to the season. Our offense is still led by a sophomore quarterback who is prone to sophomore mistakes. If you really believe this team should win every game, would you be interested in these magic beans I am selling? Coming back down to reality after a fast start hurts. Yet, at the same time it is impossible to ignore that this offense (that will largely return intact next year) has gotten much better. On top of this, the defense is depending on something like 10 freshmen and sophomores to be regular contributors. Freshmen generally are better by the time they are juniors. Reality tells us this team isn't as good as we wanted to believe, but it also tells us this team has a lot of improvement ahead of it. That isn't something most of us wanted to hear, but it is what we needed to hear. Five and one. Just breathe. This is still a good young football team that was beat by a more experienced, and yes, better football team. Having said that, we need to keep in mind that a different outcome on about a half dozen plays could easily have reversed the score. This is not 2009. I still believe! I won't give him a free pass on some of his recruiting priorities and misfires, but who could have forseen Emilien and Turner being busts? The fact is we have a bunch of young guys on the field now who could develop into good to great defensive players in a few years. IMO Roh, Black, MRob, Johnson, and Avery could all be All-Big Ten type players, along with both Cam and Thomas Gordon, Kovacs, Talbot and Christian being solid contributers. Add in the development of Campbell, Ash, Wilkins, Ryan, and Vinopal, as well as the defensive recruits we pull in this year and I have no doubt this defense could be a top 25 unit (if not better). It is just going to take a little more time than most people are willing to grant him. You can take a man out of the midwest, but you can't take the midwest out of the man. Written by Zach Travis. Simple theme. Powered by Blogger.